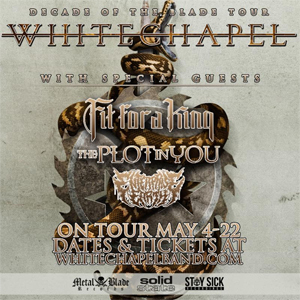 Currently finishing up work on their upcoming sixth full-length, WHITECHAPEL will head back out on the road next month for their final headlining tour in support of their latest album, Our Endless War. The seventeen-date journey will kick off May 4th in Fayetteville, Arkansas and wrap up on May 22nd in Wilmington, North Carolina. Support will be provided by FIT FOR A KING, THE PLOT IN YOU And ENTERPIRSE EARTH. Never content to remain idle, WHITECHAPEL - who've spent the past few years on the road with the likes of SLAYER, KING DIAMOND, SUICIDE SILENCE, and other premier acts - plans to tour North America this Summer and beyond, supporting their as-yet-untitled new full-length. Reuniting with producer Mark Lewis (Audio Hammer Studios), the follow-up to 2014's Our Endless War -- which debuted at #10 on the Billboard Top 200 chart -- is poised to dominate the music world in 2016. Stay tuned for details!